Our private tours to Russia are customized to meet your personal needs and interests and satisfy the most discerning traveler. For those of you who like to travel at their own pace and do not want to join a group, we recommend a wide variety of well planned private itineraries in Russia. Our private tours of Moscow, St. Petersburg and the Golden Ring include all major sighseeing landmarks and allow plenty of time for optional activities. You may add a visit to Gorky Park or Russian banya in Moscow, Museum and Galleries Erarta or Faberge Exposition in St. Petersburg, Jewish Heritage tour in both cities and other amazing adventures to make your trip more memorable. 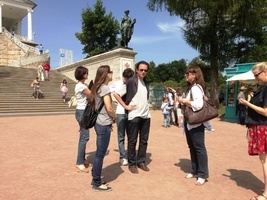 Our experienced tour guides will assit you through every step of your trip. They will help you to obtain performance tickets, make boat reservations, attend to personal matters if becomes necessary, make restaurant and shopping suggestions and recommendations. Our comprehensive private Russian travel services include airline reservations, Russian visas, hotel accomodations, train tickets, private guides and drivers, entrance and performance tickets. 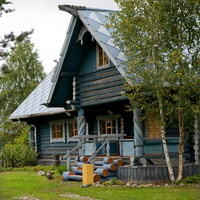 Our "Russian" background, first-hand personal life experiences and extensive travel in Russia allow us to offer the best professional advice combined with great services and excellent rates. 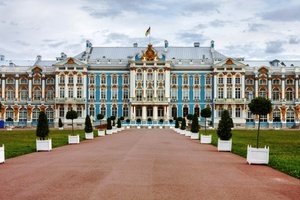 A comprehensive private tour of Moscow and St. Petersburg which includes accommodations, transfers, daily sightseeing with a private guide, evening activities, Russian cuisine dinners, folk shows and performances. High-speed Sapsan train between the cities. Russian visa included. THE MOST COMPREHENSIVE RUSSIAN TOUR ON THE MARKET! 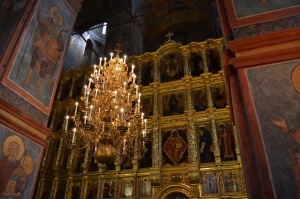 This tour combines 3 days in Moscow and 4 days in St. Petersburg filled with a superb all- inclusive private sightseeing program and a 7-day cruise aboard luxurious M/S Volga Dream that sails the Volga river through the heart of ancient Russia and stops in small Russian towns and villages that are part of the famous Golden Ring. This extensive, 12-day tour lets you explore the sights of Moscow and St. Petersburg, as well as a wonderful 2-day excursion to the Golden Ring countryside to visit the old towns of Suzdal, Vladimir and Sergiev Posad. Choice of hotel category from Superior Deluxe to Tourist Class. Discover Moscow and St. Petersburg with private sightseeing to the most famous sites, includes transfers, accommodations and overnight train between the cities. Choice of hotel category from Superior Deluxe to Tourist Class. An amazing tour of Moscow and St. Petersburg providing three days in Moscow with all sightseeing included, overnight train between the cities, five days in St. Petersburg with all the famous sites there included, as well as a full-day tour to Yusupov Palace with its vast art collection and the infamous Rasputin’s cellars. Hotel choices from Superior Deluxe to Tourist class. 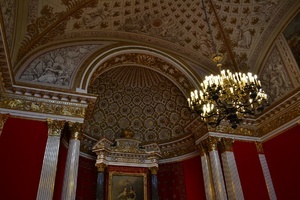 Our most comprehensive St. Petersburg small group tour includes all major sites, visits to the Hermitage Museum (including General Staff Building), Pushkin, Peterhof, Yusupov Palace, Peter-and-Paul Fortress, St. Isaac's Cathedral, Kronstadt and St. Nicholas Naval Cathedral and much more. Max group size is 15 people. 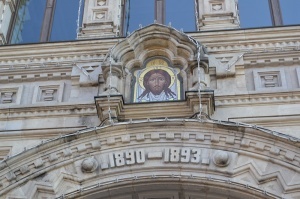 This 4-day tour takes you to Moscow with all the famous sights included, as well as an all-day tour into the Golden Ring countryside to explore the town of Sergiev Posad and the Trinity Monastery of St. Sergius. Private tour of St. Petersburg includes city tour with its main attractions, visits to the Hermitage, St. Isaac's Cathedral. 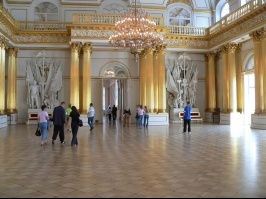 Peter-and-Paul Fortress, Peter's Grand Palace and Park with fountains, Catherine Palace and Amber Room. This unique 8-day tour will let you explore Moscow and St. Petersburg with all the best sightseeing, as well as an overnight train ride from Moscow to the old city of Novgorod, Russia’s first capital dating back to the 9th century, famous for its historic monuments and medieval churches. Not many people travel to Russia in winter but those who do have a very hard time finding a group tour. Now you have it: explore the Russian winter spirit and celebrate New Year's in Moscow on this special Russian adventure with New Year's celebrations in the Red Square, Visit famous landmarks, and tourist attractions, keep yourself warm and happy.